• Directed by Kendra Kannegaard and student directed by Genevieve Bellavance. 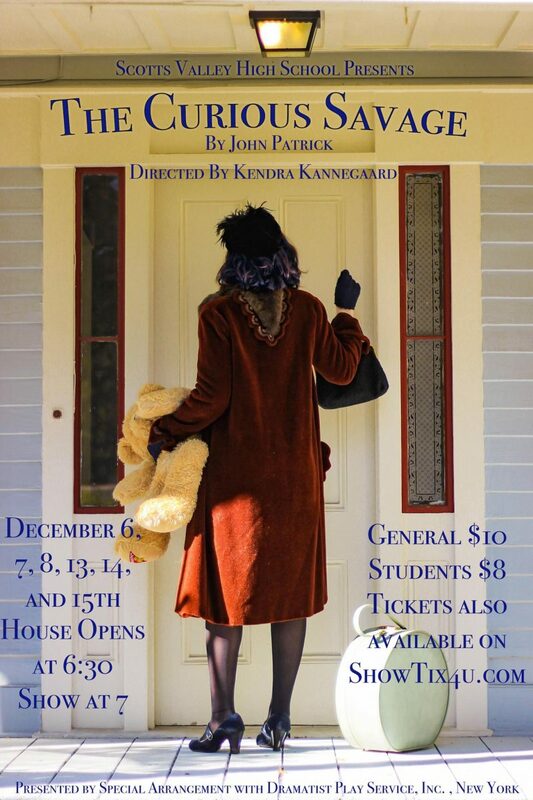 • The Curious Savage runs December 6, 7, 8, 13, 14, and 15th with curtain at 7pm. This warm-hearted comedy centers on Mrs. Ethel P. Savage, a kind and eccentric widow. As the recipient of her deceased husband’s large estate, she wishes to make the best use of it, despite her stepchildren’s selfish attempts to get their hands on it. Mrs. Savage, always one step ahead, has put her wealth into negotiable bonds in the hopes of establishing a fund to help others realize their hopes and dreams, much to her children’s horror. They then have her committed to a sanatorium, The Cloisters, in the hopes of shocking her to her senses. While there, she meets and befriends the residents, a collection of uniquely wonderful individuals with hearts of gold but who cannot adjust themselves to the outside world. With the help of her new-found friends, Mrs. Savage attempts to lead her stepchildren on a wild goose chase which she hopes will teach them a valuable lesson. This eccentric comedy reminds the audience that the seemingly forgotten virtues of kindness and affection can often be found in the least likely of places. Featuring two talented and delightful casts comprised of young actors Lily Holombo, Amira Aspromonte, Brianna Campbell, Jonathan Bruce, Justin Ifland, Tessa Snyder, Jenelle Jacob, Ayanna Palmer, Bria Quitzau, Willa Reed, Justine Reynolds, Finn Vannerus, Elijah Wenn, Justin Burnett, Lexi Daniels, Sydney Scott, Sebastian Hardison and Zack Packer, The Curious Savage runs December 6, 7, 8, 13, 14, and 15th with curtain at 7pm. • Tickets are $10 for general and $8 for students and are available at the door and online at showtix4u.com.